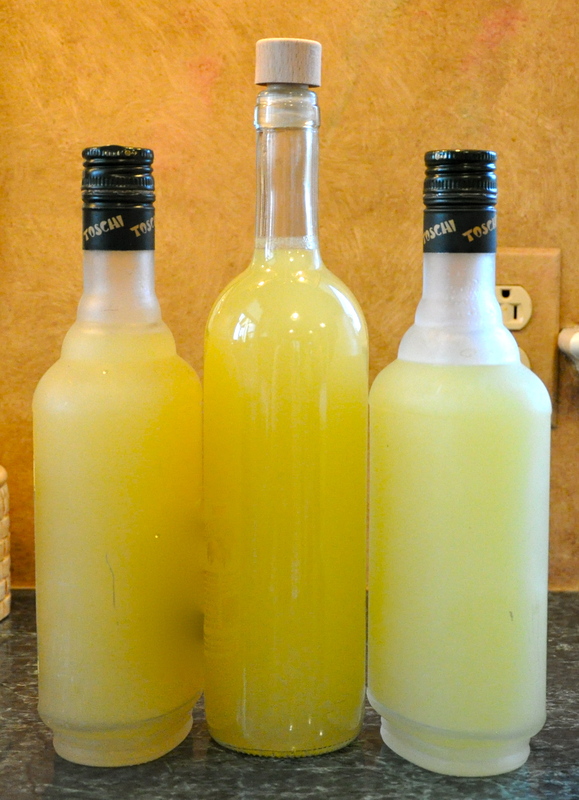 It’s been almost a year since I shared the story about the grain alcohol that tasted like water when I opened the bottle; and for those of you who read that tale (https://adventuresofamiddleagemom.wordpress.com/2009/12/23/tales-of-lemoncello/) you know that my son Max did replace the grain alcohol with water and I did have to begin at the beginning to make my Italian girlfriend Anna’s much-coveted, much-praised lemoncello. This year I didn’t have any problem with the Everclear grain alcohol I purchased (and promptly hid in a deep, dark, obscure spot where neither the 19- nor 16-year-old could find it. I took it out of safe keeping today and finished the brewing process. 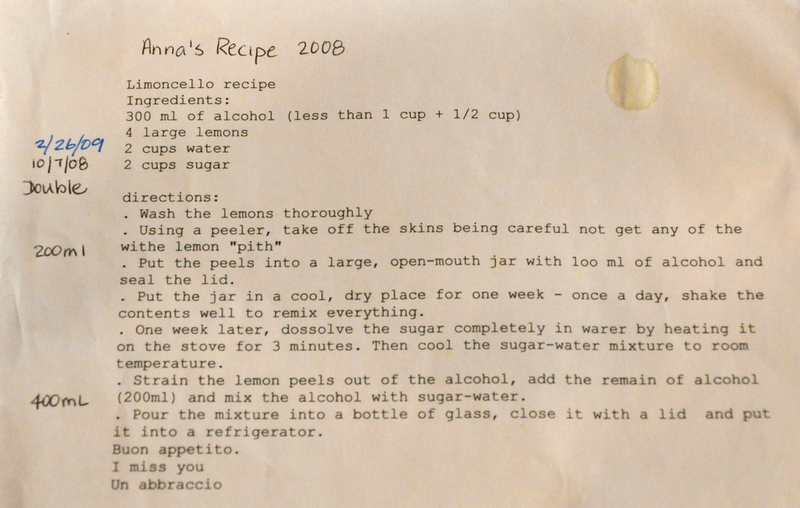 The lemon skins had marinated in grain alcohol for two weeks (more than the recipe recommends, which I think Anna told me was the bare minimum of time). The Real Deal, not a vodka-based imitation! Today I cooked up a simple syrup, let it cool, fished the by-now-pickled lemon skins out of the now-yellow grain alcohol, added some more grain alcohol per the recipe Anna had given me and bottled the whole mixed-up shebang together. I’m a little sticky from the bottling process since I can never keep the funnel balanced perfectly as I pour. It’s too early in the day for me to be licking my fingers clean either. . .unless I want to go to bed really early. . .and wake up late, possibly with a dire hangover. Moderation is key in so many things, especially drinking this lemoncello! Double the recipe and share with family and friends. You hear that Joe and Phil? My extended family celebrates Christmas together the Sunday before Christmas. So yesterday, as usual, we travelled to Central Jersey to my sister Cindy’s home. I look forward to the gathering of adults (my generation), teens and young adults (my kids are still teens and their cousins are in their late 20s/early 30s) and little kids (two great-nephews, babe in arms and kindergartener). It’s always fun. Football frequently takes center stage with lots of teasing back and forth between the True Blue Giants fans and the Gang Green Jets fans. It’s lively and, well, family. My sister put out a fine spread of food from appetizers to main course, side dishes and desserts. Most of us eat too much and have to rest our eyes for a little while after we eat! It’s part of the tradition, I guess! The newest member of our clan, Baby Nathaniel, was fascinated with the hubbub and his friendly cousins. It was wonderful to watch his eyes widen in delight, his attempts to “talk,” and his wriggling to get a better view of his world.